Lucy & Chris, a very nice couple from England, had their wedding reception at the beautiful “Villa Petrolo” Loc. Petrolo N° 30, Mercatale Valdarno, 52021 Bucine (AR) www.petrolo.it/en/. Villa Petrolo, deep in the magnificent woods and the green hills of this wonderful bit of Tuscany and surrounded by centuries-old cypresses, is the manor house of Tenuta Petrolo . In front of the Villa there’s a large private Italian garden and downstairs there’s a swimming pool and a tennis court. 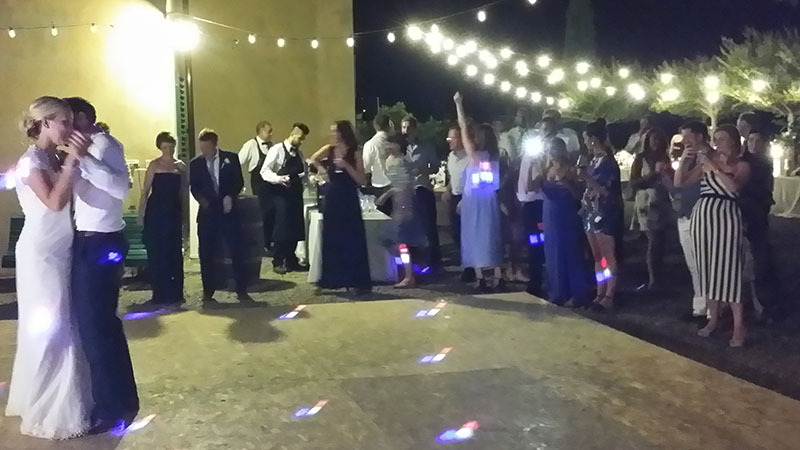 The entire event took place inside the Tenuta Petrolo, from the ceremony and the aperitifs near the swimming pool, to the delicious wedding dinner in the courtyard in front of the villa, the background music and wireless microphone for the speeches being provided by the band, Guty & Simone duo, the Italian wedding musicians. All the day went perfectly also thanks to the wedding planners Pia and Michele from Olive in love. During the after dinner party they played under a big tree by the side of the villa. Since all round the Villa there’s gravel on the floor, the bride and groom have rented also a large wooden dance floor very useful to let all guests easily dance. As usual Guty & Simone played some of the hits enlisted into their amazing live repertoire and also some EDM and R&B dj sets too. Everybody enjoyed the songs played on the night picked by Guty & Simone at the moment taking cue to the bride and groom favourites list received by email and, also due to this reason, the bride and groom and guests kept on dancing like crazy the whole evening!! !